The name Seth Thomas is symbolic of value and excellence of craft, as a result of the variety of sophisticated styles it has produced since 1813. As the longest established clock maker in the United States (nearly 200 years), Seth Thomas is recognized as one of the most respected brands of clocks in the world. During its early years, Seth Thomas quickly gained an impeccable reputation for producing masterfully crafted grandfather clocks. Soon after, the company was also known for designing and producing some of the country's most renowned tower clocks, including the tower clock at Grand Central Station in New York. Today, Seth Thomas's reputation continues to be well earned. Our blend of quality and impressive design has made us the industry's premier clock maker in the 21st century also. Our posh collection of clocks ranges from classic strike and chimes to unique styles crafted in contemporary metals, colorful resins and aged finishes. In addition to decorative mantel, wall and table top clocks, Seth Thomas produces a wide variety of timepieces perfectly suited for gift giving for the office as well as the home. It is a name recognized and trusted by consumers of all age groups and backgrounds. The realization of a great American dream began in 1875 when Joseph Bulova, a 23-year-old immigrant from Bohemia, opened a small jewelry store on Maiden Lane in New York City. This modest enterprise was to evolve into one of today's preeminent watch and clock companies. In 1911, Bulova began manufacturing boudoir and desk clocks, along with fine pocket watches, which he made and sold in unprecedented numbers. During World War I, wristwatches were issued in the military for their greater convenience. Returning veterans brought home the new fashion and a new market emerged. Bulova already had sufficient production facilities and a mastery of jewelry design, so his company introduced the first full line of men's jeweled wristwatches in 1919. It was followed by the industry's first full line of ladies wristwatches with radio's first commercials, broadcast nationally in 1926: "At the tone, it's 8 P.M., B-U-L-O-V-A Bulova watch time." two years later, Bulova introduced the world's first clock radio. In 1931, Bulova conducted the watch industry's first million-dollar advertising campaign. And through the Depression years, Bulova supported retailers by offering Bulova watches to buyers on time-payment plans. As the next decade began, Bulova aired the first TV commercial. A simple picture of a clock and a map of the United States, it preceded a Brooklyn Dodgers baseball game on July 1, 1941, and proclaimed , "America runs on Bulova time" By then, Arde Bulova, Joseph Bulova's son, was also producing timepieces for the military. With the U.S. entry into World War II, the Bulova factories immediately put their perfected mass-production techniques and skilled craftsmen to work on precision military equipment. Bulova provided the U.S. government with military watches, specialized timepieces, aircraft instruments, critical torpedo mechanisms and fuses. At the war’s end, the Joseph Bulova School of Watchmaking opened its doors to help disabled veterans become self-sufficient. In recent decades, Bulova timepieces have kept official time aboard Air Force One, and Bulova products have repeatedly been awarded to visiting dignitaries as Presidential Gifts of State. Bulova has also served as America’s official watch to the U.S. Olympic team. Year after year, having satisfied customers for over a century, Bulova continues its tradition of growth and innovation. Today Bulova remains a totally U.S. –owned company, enjoying the financial resources and management support of Loews Corporation. As a result, Bulova now offers the widest range of styles in its long history. With over a century of technological leadership and service, Bulova is among America’s most recognized names. A state-of-the-art precision movement. The quartz, battery operated chime and standard movement are guaranteed to be accurate to within three minutes a year. Bulova keywind mechanical movements are produced in Europe to the exacting standards of master clock makers. The finest quality materials including carefully selected wood, solid brass, lead crystal, imported marble, porcelain and leather. Bulova clocks span a range of styles and forms with unmatched artistry and technological excellence. Combining Bulova’s reputation for technological excellence with the proven charm of cherished trademarks designs gives the Licensed Products Collection truly unique market appeal. Instantly recognizable, the Frank Lloyd Wright, and Harley-Davidson make particularly memorable gifts, while attracting both budding connoisseurs and established collectors. Frank Lloyd Wright (1867-1959) is recognized as one of the greatest architects of the twentieth century. Using innovations in design and engineering made possible by newly developed technology and materials, his work heralded a new thinking in architecture, stressing “organic” structures in harmony with their natural surroundings. Bulova’s award-winning Frank Lloyd Wright Collection honors this American genius with an exceptional group of clocks including tabletop an wall models, as well as a number of uniquely stylish watches. Each style is part of the Frank Lloyd Wright Decorative Designs Collection, certified by the Frank Lloyd Wright Foundation, Taliesin West, Scottsdale, Arizona. Nearly one hundred years ago, Franz Hermle began manufacturing and selling mechanical clocks. In 1922, Franz Hermle founded the Franz Hermle Clock Company in Gosheim/Wuerttemberg, Germany. Within ten years the company became known as one of the most modern and efficient manufacturers of clock movements in the clock industry. Franz Hermle and his sons' dedication weathered the effects of WWII and made Franz Hermle and Sohn, prosper while other companies capitulated. Now in its third generation, Franz Hermle and Sohn employs over 500 people in 4 locations in Germany and an additional manufacturing facility, Hermle Black Forest Clocks, in Amherst, Virginia, USA. We export clocks and clock movements to more than 100 countries worldwide and are dedicated to leading the industry in computerized and automated precision manufactured clock parts and mechanical and quartz movements. It’s what Howard C. Miller insisted on when he founded the company back in 1926, at the age of 21. Howard Miller was schooled in the fine art of clock making by his father, Herman, in the Black Forest region of Germany. Howard developed into a visionary whose keen sense of innovation spawned a tradition of excellence that has been uncompromised through three generations. Cuckoo clocks evoke a unique and comforting emotional response in all of us. Almost everyone has a parent, grandparent or great aunt who “had one just like that”. 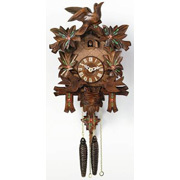 Since 1988, River City Cuckoo Clocks has offered the finest collection of cuckoo clocks available from those German manufacturers who have consistently displayed outstanding quality, originality and attention to detail. Rhythm Watch Company of Japan was established in 1950. Over the years, our parent company has developed into a world leader in the manufacturing of timekeeping products with the production of over 20,000,000 clocks and movements sold throughout the world. What sets Rhythm apart from the rest of the industry is it's investment in the development of state-of-the-art features and designs. Rhythm's approach is "Don't follow, be a leader." and that is what Rhythm has done by developing the features and designs that meet the needs of today's lifestyle of the consumer also keeping in mind the merchandising needs of you, the retailer, with motion and sound that attracts the consumer. Since Rhythm is a vertically integrated manufacturing company, we make what we sell. Total quality control is enforced from design concept right through the entire manufacturing process. This assures you and your customers of a quality timepiece from Rhythm. Rhythm is a worldwide company that has a reputation for quality and design. We look forward to developing a strong relationship with you.